If you are a regular reader here, you know that I have 4 daughters. Some days, the thought of all 4 of them becoming teenagers scares the pants off of me. After reading Kate Conner's book Enough: 10 Things We Should Be Telling Teenage Girls, I feel much better equipped to raise my daughters through those teenage years. You may have read the post "Ten Things I Want To Tell Teenage Girls” by fellow blogger, Kate Conner, which garnered more than 2 million views in two weeks. (If you haven’t, you can check it out here: http://kateelizabethconner.com/ten-things-i-want-to-tell-teenage-girls/. ) In a book based on her post, Kate Conner calls us to action in Enough: 10 Things You Should Be Telling Teenage Girls. We all have teenage girls in our lives who we love, whether it’s a sister, friend, or daughter. Kate has identified 10 things these girls need to hear today from someone who loves her. Peppered with wit and laced with grace, Kate’s list tackles relevant issues like Facebook, emotions, drama, tanning beds, modesty, and flirtation. Woven into each chapter is a powerful message of worth that transcends age, and will touch the souls of women, young and old alike: You are beautiful. You are valuable. You are enough. A former youth-worker, wife to a college minister, and a young mom in her twenties, Conner stands squarely in generational gap, the perfect place from which to bridge it. Conner offers herself as a translator, helping you to speak your teenager’s language and equipping you with a fresh perspective from which to engage your teenage girl—one that may enable her to truly hear your heart (and your wisdom) for the first time since puberty. When I read, I like to write down little nuggets of brilliance - those things that I want to remember, those quotes that speak to me. While I was reading Enough: 10 Things We Should Be Telling Teenage Girls, I wrote down over 2 pages of these gems. Kate Conner begins her book by tackling one of the most controversial topics when dealing with teenage girls: modesty. Her use of wit along with practical knowledge gave me more confidence in talking to my own girls about this. I love this quote from p. 13: "Modesty is about choosing clothes that intentionally communicate what you want the world to know about yourself." By helping my girls to understand that concept, maybe we can avoid some of those arguments so familiar to moms of teenage girls all over. Another chapter discusses being content with our bodies so that our daughters can be content with theirs. I really needed this reminder. Yet another talks about drama. Is there a better word that comes to mind when you thing of teenage girls? Mrs. Conner tells us that girls who are busy doing things for a purpose don't have time for drama. This helps affirm our family's decision to allow the girls to pursue the things they enjoy - club soccer, ballet, softball. I've been taking this book with me everywhere. I even took it to Soccer Girl's practice last week to share parts of it with some of the other moms there. It really is THAT good. 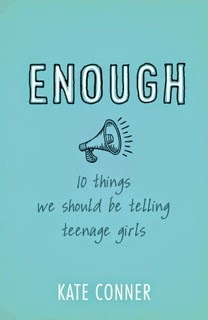 Enough: 10 Things We Should Be Telling Teenage Girls sells for $15.99 at B&H Publishing Group. You can learn more about Kate Conner and Enough: 10 Things We Should Be Telling Teenage Girls by visiting B&H Publishing Group, Facebook, Twitter, Instagram, and Pinterest.